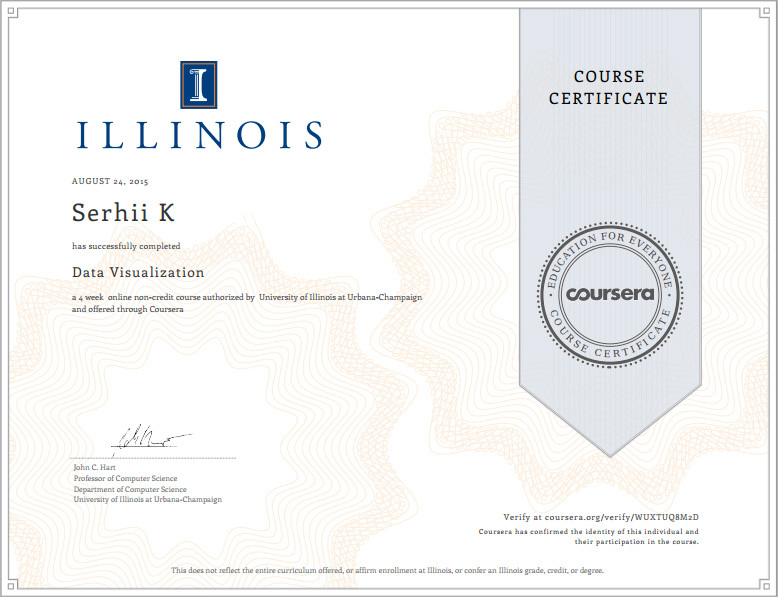 SoftElegance’s employee Serhii K. received the certificate about successful graduating online course “Data Visualization” from University of Illinois, on August 24, 2015. The course is about to learn to present data to an observer in a way that yields insight and understanding. It introduces graphics programming, focusing primarily on two-dimensional vector graphics and the programming platforms for graphics. This infrastructure includes lessons on the human side of visualization, human perception and cognition to gain a better understanding of the target of the data visualization. The event itself is general – studying well and gets certificates after successful finishing the courses. It’s a normal situation. But Serhii tells us about the additional feature of such studying – getting additional knowledge in Big Data industry and learning English. Courses, as a rule, are presenting as video classes in English. So, in order to successfully graduate them, you must listen and clearly understand what lecturer is speaking about. Unlike other studying methods, this one can be more easily for you because you are not studying some very abstract situations like dialogs during meeting on a street or a cafe. Instead of this, you are studying subject which is definitely interesting for you, and that is why you have a great motivation to listen and understand all what you hear. The other point – you are studying some knowledge area , that is already familiar for you, so it will be easy to guess right meaning of new words and memorize them. In any case, this is a great occasion to spend your time more productive, than studying English by watching original movies or serials. At the same time you are growing up as a specialist and cultivating your English language skills. Two knowledge in the same time – it’s really cool! Founded in 1993, SoftElegance is a custom software development company that has been providing reliable services for implementation of SaaS systems, sophisticated business solutions, engineering applications, and business processes automation software. A variety of companies, ranging from dynamic small and medium to Fortune 500, across oil and gas, drilling, engineering, and manufacturing industries, use SoftElegance’s software development outsourcing services. With clients from the U.S. and the E.U., offices in London, Houston, and development centers in Eastern Europe, SoftElegance assists customers in delivering innovative software solutions on a global scale.